Pay 1000 LP; Special Summon 1 "Fire Hand", "Ice Hand" or "Magic Hand" from your Deck in Attack Position. You can banish this card from the GY; add 1 "Prominence Hand" from your Deck to your hand. You can only use 1 "Extend Hand" effect per turn, and only once that turn. If a "Gusto" monster is Special Summoned to a zone this card points to: You can sent 1 "Gusto" card from your Deck to your GY. If your "Gusto" monster is destroyed by your opponent's card and sent to your GY: You can Special Summon 1 "Gusto" monster from your hand or GY with a different name from the destroyed monster. If this card is destroyed: Special Summon 1 Psychic "Gusto" monster from your Deck. You can only use each effect of "Wendy, Initiated into Gusto" once per turn. Whoops, didn't see that in the last page. Once per turn, if you Summon a "Fortune Lady" monster: You can Special Summon 1 "Fortune Lady" monster with a different name from your hand or Graveyard, then increase the Levels of all "Fortune Lady" monsters you control by 1. "Fortune Lady" monsters you control can increase their Levels higher than 12. "Fortune Lady" monsters you control are unaffected by the effects of your opponent's monsters, except monsters with a higher Level than themselves. Yes, this makes Fortune Ladies entirely immune to all Link and Xyz effects. This also makes Dark and Earth much easier to consistently field, and helps boost your stats a bit. Lore: If this card is banished to activate a "Lightsworn" card's effect: You can Special Summon this card, but you cannot Special Summon Level 4 monsters for the rest of the turn. If this card is Special Summoned, or sent from the Deck to the GY: You can destroy 1 Special Summoned monster on the field. Once per turn, if another "Lightsworn" monster(s) in your possession activates its effect: Send the top 3 cards of your Deck to the GY. During damage calculation, if your DARK monster battles, and you would take damage: You can Special Summon this card from your hand, and if you do, you take no battle damage from that battle. Cannot be destroyed by battle while in Attack Position. During the End Phase: You can Special Summon 1 "Umbral Horror" monster from your Deck. You can only use this effect of "Umbral Horror Ghast" once per turn. When this card is activated, you can move a Warrior XYZ monster from your Extra Monster zone to your Main Monster zone. 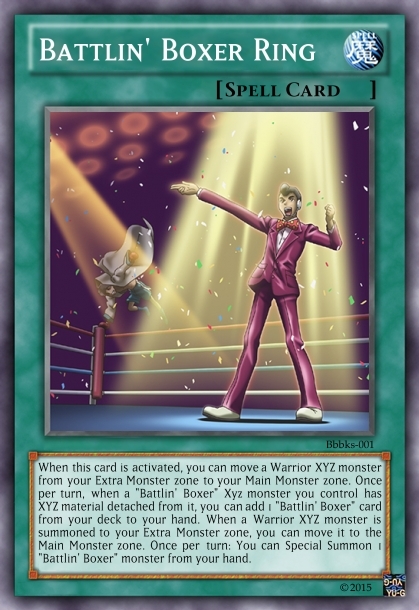 Once per turn, when a "Battlin' Boxer" Xyz monster you control has XYZ material detached from it, you can add 1 "Battlin' Boxer" card from your deck to your hand. When a Warrior XYZ monster is summoned to your Extra Monster zone, you can move it to the Main Monster zone. Once per turn: You can Special Summon 1 "Battlin' Boxer" monster from your hand. PE: You can Normal Summon "Hazy Flame" monsters without tribute. Your opponent cannot target "Hazy" Spell/Trap cards you control with card effects. ME: Your opponent cannot target this card with card effects. If you control a face-up Spell/Trap, you can Special Summon this card from your hand. If this card is sent to the GY: You can target 1 "Hazy" monster you control; that target cannot be tributed, also double its ATK until the End Phase of the next turn. "Mist Valley" monsters you control gain 300 ATK/DEF. If a "Mist Valley" card is returned to your hand: You can target 1 card on the field; shuffle it into the Deck. If this card is in your GY: You can target 1 "Mist Valley" card you control; Return it to your hand, and if you do, set this card, but banish it when it leaves the field. You can only use each effect of "Thunderous Winds of Mist Valley" once per turn. You can Special Summon this card from your hand by discarding 1 Insect monster. Once per turn, if you Summon a Level 4 or lower "Battlewasp" monster(s): You can target 1 of those monsters; reduce this card's ATK, DEF and Level by the Level of the target, and if you do, inflict damage to your opponent equal to this card's Level x 200.